SAF West Opens Oregon Sales Office SAF – Southern Aluminum Finishing Co, Inc.
August 31, 2015 — SAF (Southern Aluminum Finishing Co.) announces a big push for Northwest sales and customer service: the opening of an SAF Northwest Sales office in Salem, Oregon. The new office opened this spring is managed by Peter Stauffer, Account Manager of Pacific Northwest. 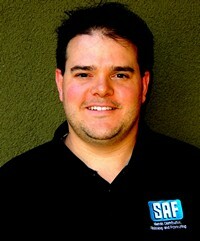 Stauffer was promoted from his previous position in Sales at the company’s SAF-West facility in Redding, CA. The SAF Oregon Sales office will focus on sales support to Pacific Northwest glazing and other contractors and suppliers in the commercial building market. “This office will help SAF meet expected growth in the Pacific Northwest’s commercial building industry, which by our estimates is poised to grow 25% over the next 5 years,” according to Penn McClatchey, SAF Co-CEO. Customers may contact Peter directly at 503-683-2404, or at the SAF Oregon Office located at 4712 Babrock Way, Salem, OR 97317. Background: SAF is a mill-direct aluminum buyer, an approved fabricator for major Aluminum Composite Panel (ACM) manufacturers, and a mill-direct distributor of aluminum coil and extrusions. Additionally, SAF is a contractor’s resource for aluminum extrusions & sheet, custom architectural panel & column systems, in addition to Commercial Cornice & Gutter Systems. With SAF plant operations in Atlanta, GA and Redding, CA customers receive timely, cost-effective coast-to-coast service for aluminum batch anodizing, painting, and architectural metal fabrication.